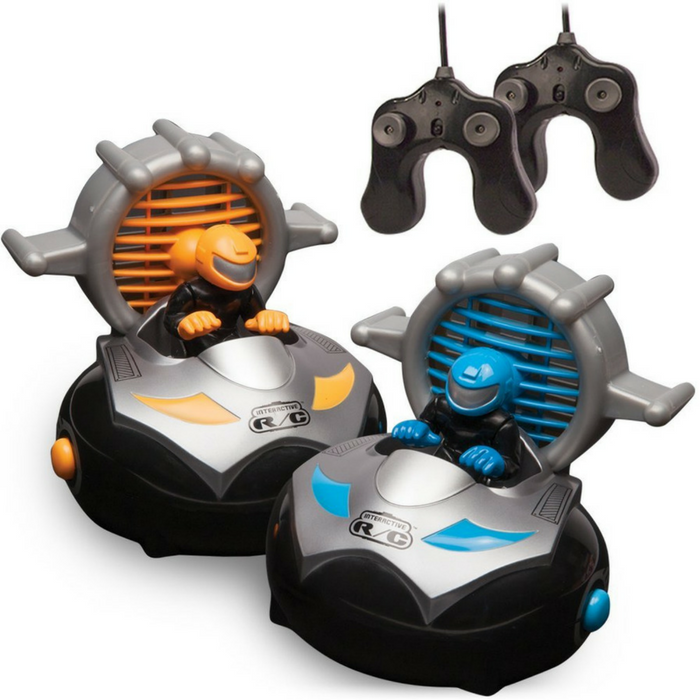 RC Bumper Cars Just $19.25! Down From $55! You are here: Home / Great Deals / Amazon Deals / RC Bumper Cars Just $19.25! Down From $55! Amazon is currently offering these RC Bumper Cars for just $19.25 down from $54.99 PLUS FREE shipping with Amazon Prime or for orders $25 or more! Bump…..and watch your opponent’s driver fly through the air! This Oppenheim Platinum 2008 Best Toy, includes 2 R/C bumper cars in futuristic style and colors. Hit your opponent’s car straight on or sideswipe it and watch his driver eject or “chuck” through the air activating cool sounds. Cars are designed with fans that really work giving the illusion of wind power and adding to the effect. Set includes 2 remotes, 2 cars and 2 drivers. Cars are full functional.